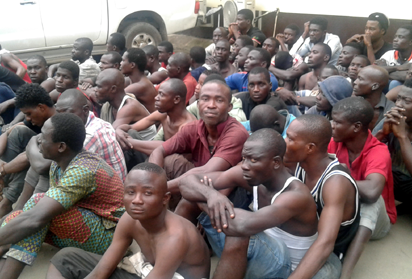 One of the 62 miscreants arrested during a raid at Oshodi and its environs by the Lagos State Task Force, weekend, Gani Yusuf, 35, disclosed that they paid N100 everyday to their ring leader for a space to sleep under the Oshodi Bridge. Another, Gbenga Ololade, 38, who came from Ibadan, the Oyo State capital, said he had been sleeping under Oshodi Bridge for three years, saying he was initiated into cultism with a particular tattoo on his face by their group leader, under the bridge. The raid, according to Chairman of the Task Force, CSP Yinka Egbeyemi, was part of ongoing efforts to flush out miscreants and other criminal elements out of Oshodi in particular and the state in general, adding that it was done on the directive of the Lagos State Commissioner of Police, Imohimi Edgal, who expressed concern over the spate of criminal activities in some parts of the state. The Chairman added that the suspects were screened, during which the minors, who were between 12 and 17 years, were referred to the juvenile homes for rehabilitation. Informing that the suspects had been charged to court on the directive of Edgal, Egbeyemi hinted that after the completion of all ongoing projects by Lagos State government around Oshodi, there would no longer be any hideout for criminals to unleash terror on innocent members of the public again. Meanwhile, 18 traders earlier arrested around Trade Fair Complex, along the Mile Two-Badagry Expressway, but released following their undertaking with the Task Force, not to return to selling at unauthorised places, have been re-arrested and charged to court.